Epaulettes became common on British and French uniforms in the mid-eighteenth Century when they competed with the gorget, various shoulder knots, and aiguillettes as distinctions for officers. By 1763 the French had a standardized system of grade designations using epaulettes for their infantry. The British wore a regimental uniform with no standardized grade insignia. By the time of the Revolutionary War stars were worn on American general's epaulettes, following the French system. The eagle as the emblem of a colonel was introduced in 1832. At the same time metal crescents were made mandatory. 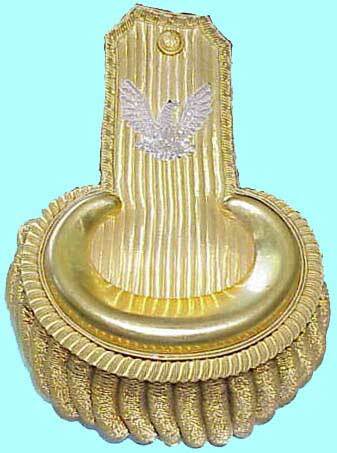 By the time of the American Civil War epaulettes evolved into a heavy insignia that was practical only for dress wear. The example shown above belonged to Joshua A. Varian of the 8th New York National Guard Regiment. That unit was mustered into Federal service twice in 1862 and 1863 for a total of four months of service. It lacks a regimental circlet, but should have an eight on a blue field.